Official announcement made. DICE 2017 Ad in newspapers, TV channels, Facebook, web, etc. 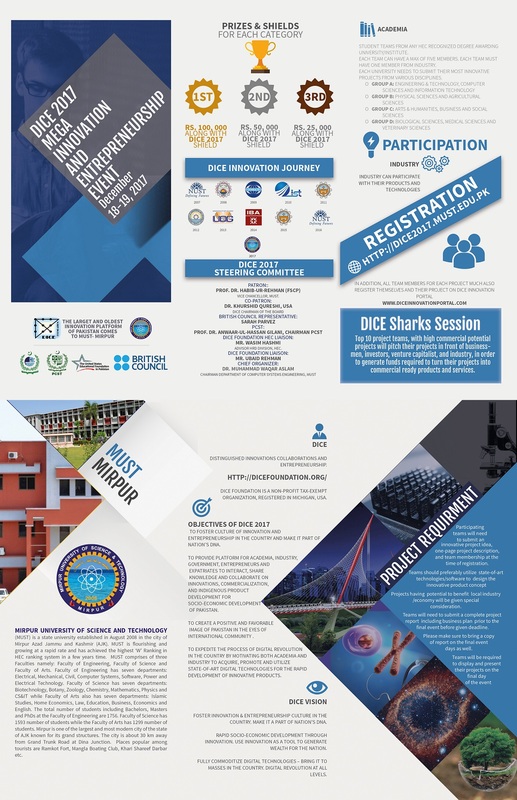 DICE 2017 Mega Event is open to all public and private sector universities. Invitation letters and emails along with DICE 2017 Brochure, sent to all VCs/Rectors, Deans and HODs. Universities submit project titles, one-page description and team membership, online. Proposal acknowledgement sent automatically as soon as team registers its project on the DICE 2017 website. Proposal acceptance sent to all participant teams. Written report/business plan submission (deadline) by participating teams using a standard template (to be downloaded from the DICE 2017 website). Reports reviewed by review committee/judges. Top 10 project teams selected for DICE Shark session. DICE Sharks investors identified, contacted and formal invitations sent.